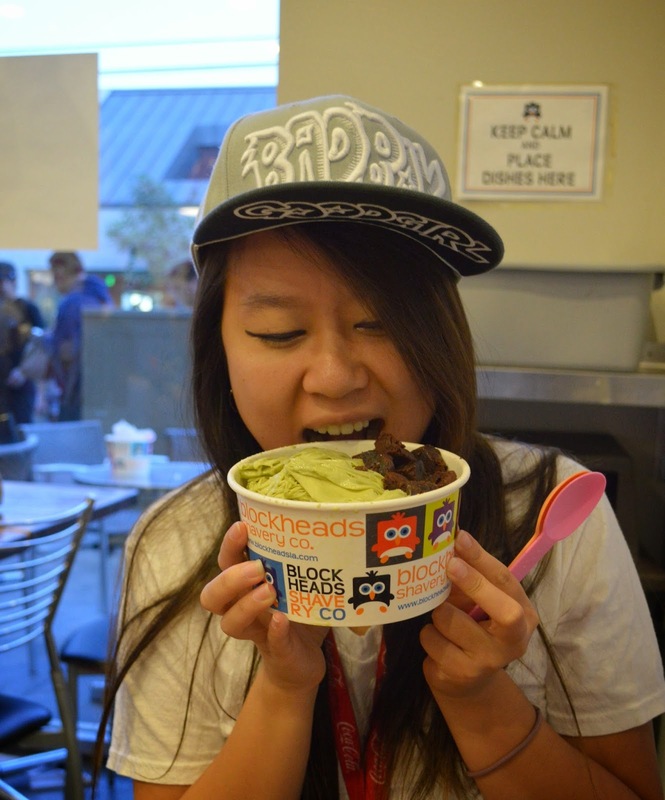 I LIKE MY SNOW THICK @ BLOCKHEADS SHAVERY CO. - LOS ANGELES - EAT WITH HOP! Note: Parking can be a pain here so I recommend parking in a nearby neighborhood street (for free!) instead of using meter parking. YUM YUM YUM! I've been wanting to try this place for forever! I definitely was not disappointed. I didn't intend to eat here but found it on my stroll down Little Osaka. Kev and I had a little adventure to try some Japanese food and when I saw the Blockheads sign, I was beyond excited! This place is located down Sawtelle street which is a street known for having plenty of delicious Asian Restaurants (mostly Japanese). The line for this place was out the door! Luckily, we didn't have to wait that long because we got there before the rush (at around 8pm). They have limited flavors of snow here but the toppings seem endless! They also have a wider variety of sauces compared to other shaved snow places that only offer the typical condensed milk. Kev and I ordered the Green Tea shaved snow with brownie bits and rice cake balls. As for the sauce, we got Strawberry Puree on the side. WHAT A PERFECT COMBO! *___* The snow was very flavorful and surprisingly went well with the Strawberry Puree. It wasn't too sweet that your teeth would fall off either! I am seriously craving this combo right now because it left a sweet memory on my taste buds; real talk. We also ordered the small size which was actually very big in my opinion and definitely sharable between 2 people. Overall, if I'm ever in the area, I will definitely come back!! the snow itself is shaved very thick...JUST THE WAY I LIKE IT! the rice cake balls were soft and chewy!! the brownie bits were a great addition! Soft and chewy too! a large is even bigger! it gets crowded at night! So, snag a table as fast as you can if you plan eating there! Strawberry Puree is a great choice for a sauce. Must Try! They have cute owls as their logo! The first 2 places have non-dessert items on their menu like popcorn chicken, noodles, boba, etc.